17 July 2014 – The top United Nations envoy to Libya today warned that the risk of a major escalation of the recent fighting in the capital is high and threatens the fledgling political process in the country. “The quick pace with which developments have unfolded in Tripoli over the past couple of weeks are a reflection of the deeply fractured political scene which continues to hang heavily over the country, undermining its fledgling political process,” said Tarek Mitri, the Secretary-General’s Special Representative and head of the UN Support Mission in Libya (UNSMIL). The recent turmoil has reportedly been some of the worst fighting since the 2011 uprising that ousted former leader Muammar al-Qadhafi and the North African nation embarked on its democratic transition. 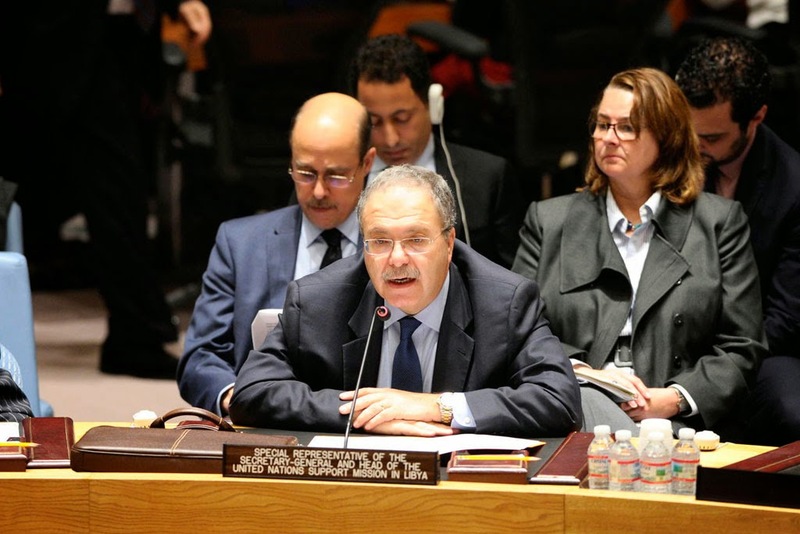 Mr. Mitri, briefing the Security Council via video-link from Lebanon on the latest developments, described what is taking place on the ground as an “all-out confrontation” between two major rival groups in the Libyan capital. “This confrontation, born out of deep political polarization, is playing itself out at the country’s international airport,” he said. What initially started as a minor incident on 5 July between elements from rival brigades at a checkpoint in the Janzour area of Tripoli, where the UNSMIL compound is located, rapidly escalated into a series of major clashes across a number of areas in the capital, he reported. “Much of the fighting within the past week has focused on attempts by different armed groups to assert control over Tripoli’s international airport. The battles have caused disruption to air traffic and all air travel has since been suspended. A call from the country’s interim government for an immediate and unconditional ceasefire has so far gone unheeded,” Mr. Mitri continued. The envoy noted that in the eastern part of the country, there has been a “marked escalation” of confrontations in the last couple of days. Benghazi’s international airport has been repeatedly shelled and is non-operational. The recent fighting in Tripoli and around the international airport brought the war closer to UNSMIL’s compound, which took direct hits from medium and high-caliber machine guns. “We were at a grave risk of being caught up in a military showdown amid indications and warnings that the fighting around our compound would intensify,” said Mr. Mitri. In view of the deteriorating situation in the capital and the closure of Tripoli International Airport, the increased security risk faced by UNSMIL and implications on the ability of its staff to carry out their work, a decision has been taken first to reduce and then later to withdraw the international staff in the country. He added that the unfolding military developments in Tripoli over the past couple of weeks have cast a shadow over the election on 25 June of the 200-member Council of Representatives, which will replace the General National Congress. The final results of that poll are expected on 20 July. The Security Council, in a statement to the press, condemned the recent violence in Libya, including the fighting around Tripoli International Airport, noting that this follows “a deeply concerning prolonged pattern of politically motivated and inter-militia violence,” making it even more difficult for the Libyan authorities to govern effectively.